Cometh the hour cometh Tiger! The hardened fans amongst you will have fond memories of the time Tiger knocked in an ace on the infamous par 3, 16th at TPC Scottsdale back in 1997. The scenes around that hole had folks throwing beer in Arizona and jumping out of their armchairs at home! The commentator knew it was coming, “They’re gonna go nuts when he hits this thing” – and they certainly delivered. When the ball hopped in, the noise even through a 1990’s JVC was deafening! Since Tiger’s ‘1’, the spectators area has grown beyond all recognition, from fans surrounding the banks of the hole, to a 20,000 seat amphitheatre. Year in year out there’s an atmosphere comparable only to the Ryder Cup (which is something we know a little about). Huge crowds booing poor shots, going crazy for good shots and making a fair amount of noise for anything in between. How much does the stadium impact the players who stand on the tee, with a 9-iron in hand and 20,000 fans screaming at them – if it does at all? On first glance, the headlines are somewhat underwhelming, there isn’t a significant difference in the scoring average, in fact a minute improvement on players scores when they are faced with the alcohol fuelled fraternity folk and corporate execs over indulging in the boxes. 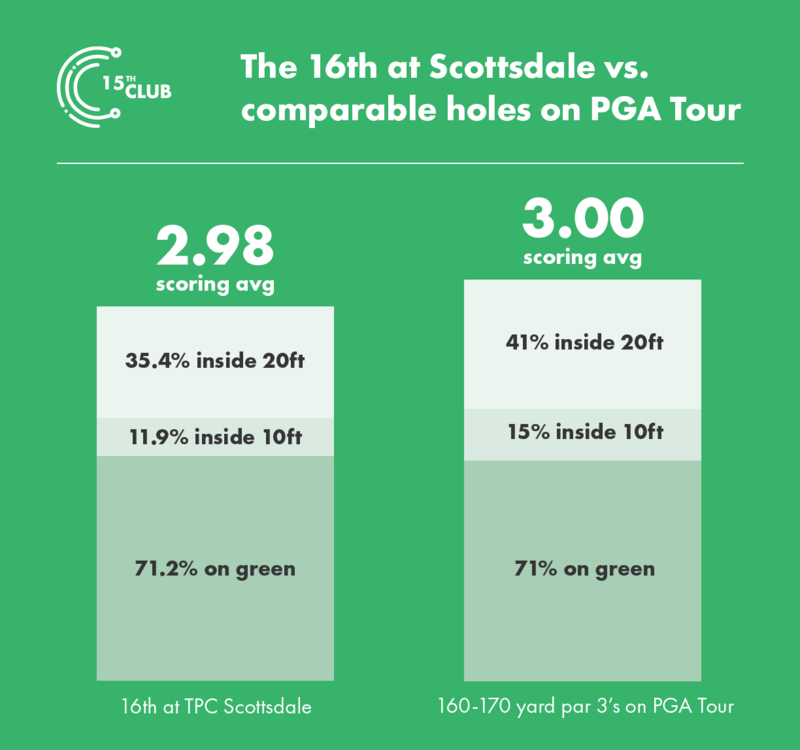 When comparing holes in the 160-170 yard bracket on the PGA Tour in the last 15 years (the 16th measures at 163 yards officially), scores averaged 3.00 compared to 2.98 on the 16th. Similarly, the 16th green was hit 71.2% of the time compared to 71% of the time on the comparable holes. Again, the difference here isn’t worth noting. That begs the question if the engineered drama at Phoenix really doesn’t have any effect on the players and it’s simply another run of the mill mid-length par 3 on tour. It’s only when you look at where players are putting it on the green that you begin to see the true story. Of all shots taken on the 16th in the past 15 years, the ball has only been put inside 10 feet 11.9% of the time, compared to 15% of the time on comparable holes. Players are therefore putting it within 10 feet 25% more often when not surrounded by 20,000 jeering fans. Further analysis of the number of shots hit within 20 feet reveals there’s a noticeable difference – 35.4% on the 16th compared to 41% on comparable holes. The 25% drop off in performance as it relates to hitting it within 10 feet is substantial. It’s something we can all relate to, standing on the first, the next few groups all stacked up around the tee and the escalating nerves. Our only thought is get it away. You’re not thinking, I want to hit that stripe down the fairway, you’re thinking I just want to hit something that’s half respectable, move away from this crowd and get on with my round. Although the odd birdie is recorded, even the best players in the world are just trying to stick it on the green, two-putt and get out of there without the heckles of 20,000 fans. Yes, the antics at the 16th this weekend are not for everyone, the purists in uproar about such a breach of etiquette in a game that prides itself in behaviour on and off the course. I for one enjoy this rare opportunity to see how the best players in the world react to an environment that other athletes have to deal with week in week out. Love it or loathe it, they will be going nuts in Phoenix this weekend.